Education and health-services sector led employment growth, expanding by 11,600 jobs; professional and business services lost the most, down 8,000 jobs. The Long Island job market gained momentum in February, preliminary state data released Thursday show. But job losses in two sectors indicate that economic uncertainty or labor shortages may be putting a damper on employment growth, local economists said. Overall the Island had 9,400 more jobs last month than in February 2018. That topped the year-over-year increase of 8,400 jobs for January, according to Labor Department data. The latest numbers extend the job market's winning streak so far this year, after revisions released earlier this month showed that the Island lost jobs in the last five months of last year. The private sector gained 9,600 jobs while the government sector lost 200 jobs, mostly because of federal government cutbacks. 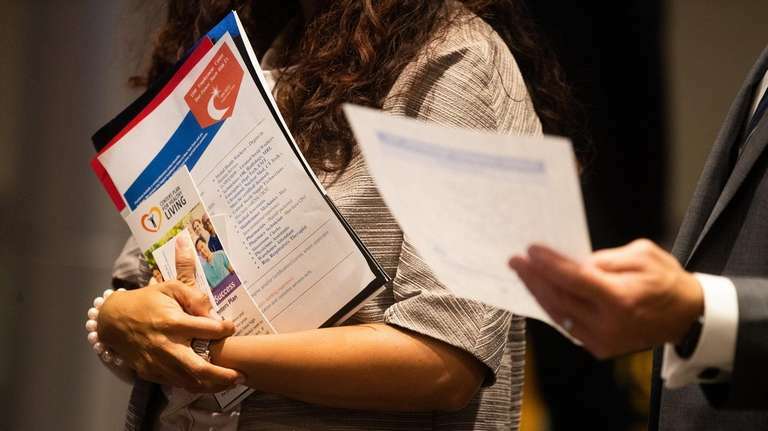 "January and February's reports show a rebound in private-sector job growth," said Shital Patel, associate economist in the Labor Department's Hicksville office. The education and health-services sector led growth, with 11,600 more jobs than a year earlier, all in health care. But the professional and business-services sector, which local economists consider a key barometer of the local job market's health, shrank by 8,000 jobs, compared with a year earlier. That followed a January decline of 8,100 jobs and a loss of 2,000 for all of 2018. Jobs in that category include skilled workers like engineers as well as support staff that companies have less demand for when they expect a slowdown. Some of the sector's declines could also be due to the lack of skilled workers in such areas as science, tech, engineering and math, Patel said, noting the Labor Department's job bank has "far more" openings than job seekers for STEM positions. "The near record low levels of the unemployment rate and the resulting tight labor market, may be having an impact on job growth," she said. Economist John A. Rizzo, Stony Brook University professor and chief economist for the Long Island Association trade group, noted that the 1,000-job drop for local restaurants between January and February could have resulted from the lingering effects of the 35-day government shutdown, which ended Jan. 25, and economic uncertainty. "Discretionary spending on restaurants and entertainment is among the first to decline in the face of uncertainty," he said. But he added, "With the partial shutdown having ended and little evidence of a recession any time soon, one may anticipate the weak jobs results for restaurants to be a temporary phenomenon." Long Island's 0.7 percent job growth rate for February compared with 1 percent for the state and 1.7 percent for both New York City and the nation, based on seasonally unadjusted data. The department uses year-over-year comparisons because local data aren't adjusted to reflect seasonal swings in employment. All told, the Island had 1.32 million jobs in February, compared with 1.31 million jobs in February 2018. The Labor Department will release the February unemployment rate on Tuesday. The January jobless rate fell to 3.9 percent, the lowest for the month since 2001. But it was the highest rate of the past six months.